AAA Academically and professionally qualified B/G age 48, 5’2” attractive much younger looking pretty fair slim kind-hearted nature lover daughter marriage delayed due to family responsibilities seeks Govigama caste Christ/Buddhist trusted partner age below 56 from Colombo suburbs with equal status. MBBS Doctors/Uni. Lecturers specially considered. Please write with genuine details with permanent address TP number and the horoscope. Affluent G/C Australian citizen parents seek a partner for their daughter 35 yrs 5’3”. She is kind hearted well-mannered scholar, owns assets, holding double degrees in Business Systems and Law. Employed at the advisory level to Australian Public Service. Cast religion immaterial. [email protected] Aust +61423043305. Born in 1987 Feb academically qualified upto a Master’s Degree from an Australian University. She is 5’3” in height fair and pretty B/G parents from Western Province seeking for a well mannered son age no more than 36, please reply non malefic horoscope only to [email protected] with contact numbers. B/G parents in Kiribathgoda. Proposed daughter born in 1989 July fair 5’7” studied in a leading Girls’ School in Colombo 7. She has obtained two degrees in Business Administration and Marketing, reading for her MBA at Sri Jayawardenapura University, while working in a private company as a Senior Executive. 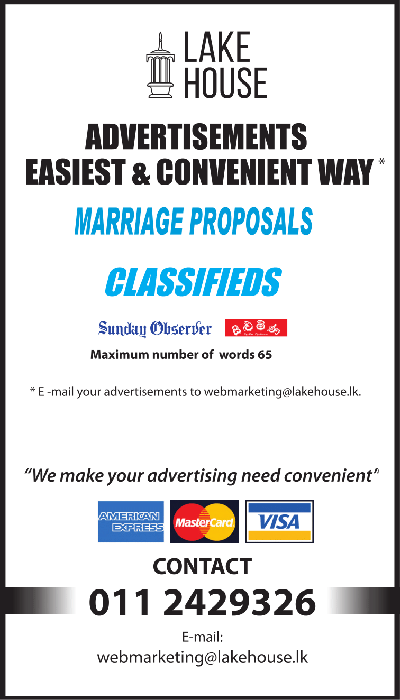 She has a house in Colombo, a suitable, handsome, educated intelligent employed son is sought. If satisfied, please email details along with horoscope. Email : [email protected] 2918163. Colombo, Buddhist Durawa 1990 November born, 5’4’’ tall, presently employed in the private sector, mother seeks for an educated, employed partner from a respectable family for her pleasant, caring, good charactered daughter. Reply with horoscope and family details with telephone number. [email protected] 011-4908669. G/B retired parents from Colombo district seeks qualified employed son for their daughter pretty, fair, slim 34 looks younger 5’4” MBA, BSc, CIMA qualified working in a reputed company as an executive, inherits assets. Please reply with family details and horoscope. Mixed parents from respectable RC family seeks suitable partner for their daughter 38 years 5’2” height pretty & fair. Well educated in a Convent, professionally qualified. Employed as group assistant manager in U.A.E. She is registered and divorced in 3 months. Please reply with family details. Sinhala / Buddhist Govt. servant parents seek a groom for their daughter born 1991 5’2” height studied in English medium. Degree holder, attached to international organization. As her brothers Australian citizen Engineers, groom, who is already in Australia or willing to migrate is specially considered. Contact horoscope details and T.P. Nos after 7.30 p.m. Email - [email protected] 035-5633344. 1993 born daughter Buddhist Govi Piliyandala respectable family, elder of two children NSBM University (Finance and Accounting) degree completed presently conducting Master Degree in Australia, Government Officer father seeks respectable son similar status, living in Australia, or expecting go to Australia. She has good dowry. Send information with copy of horoscope. [email protected] 0112703757.